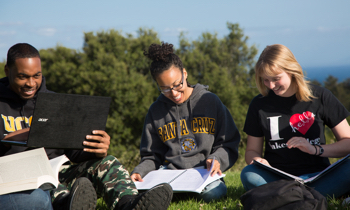 Undergraduate applications to UC Santa Cruz have reached a record high, showing increased interest from California students and those from other states and countries seeking a university experience centered on student success and driven by breakthrough research and innovation that continues to gain national and international recognition. More than 52,000 students—a new record—applied to be new first-year students for the fall 2017 quarter, a 6.9 percent increase from the previous year. The UC application deadline for transfer students was extended to Jan. 3. UC Santa Cruz saw a 6.4 percent increase in the number of California high school seniors applying. Worldwide awareness continues to grow about the campus’s blend of high-impact research with tight-knit communities of learning, similar to small liberal arts colleges. Applications from out-of-state students increased by 2.5 percent and from international students by 13 percent. There was also increased interest from ethnically diverse California students. The campus received more freshman applications from African Americans (6.5 percent more); from Asian Americans and Pacific Islanders (5.7 percent more); and Chicanos/Latinos (11 percent more). At a time when hateful rhetoric has targeted many groups—including undocumented students, the lesbian, gay, bisexual, trans, and queer communities, women, and international students—UC Santa Cruz continues to promote a community built on mutual respect, trust, and compassion. UC Santa Cruz, which became a Hispanic-Serving Institution in 2012, was recently awarded a $5.7 million grant, its third major HSI grant from the U.S. Department of Education, to support efforts to keep Latino and low-income students on a path to graduating with degrees in science and engineering. Admissions staff anticipate that a higher percentage of students will accept UC Santa Cruz admissions offers in spring, following the global recognition of research done by Professor Harry Noller, who was awarded a $3 million Breakthrough Prize in Life Sciences earlier this month revealing how the complex molecular machines called ribosomes translate genetic code and build the proteins in all living cells, thereby connecting modern biology to the origin of life. The Breakthrough Prize, founded by leading Silicon Valley entrepreneurs including Mark Zuckerberg and Sergey Brin, honors paradigm-shifting research in the fields of fundamental physics, life sciences, and mathematics. This year, UC Santa Cruz ranked 30th in the U.S. News and World Report’s list of top public national universities. Additionally, the campus’s commitment to sustainability was underscored by the Princeton Review’s list of top green colleges. UC Santa Cruz ranked No. 7. Undergraduate students who arrive in the fall will be part of the campus’s residential college communities for living and learning, as well as host of special programs, including the Scholars Program, Smith Society, and ever expanding opportunities for undergraduate research, internships, and creative projects with world-class faculty. Like the eight other UC campuses that admit undergraduate students, UC Santa Cruz will aim to increase the number of total California undergraduates as part of UC President Janet Napolitano’s plan to increase systemwide enrollment of California undergraduates in the next two years. Undergraduate applicants will be notified of admission decisions and waitlist invitations beginning mid-March. Admitted first-year students have until May 1 to indicate their intent to enroll and transfers until June 1.